This Inklingo PDF includes layouts to print on fabric. There are back-basting layouts which give perfect positioning with scraps—without printing the shapes or using templates! This additional free Inklingo PDF teaches how to use the print dialog box to print San Kamon in the sizes you want. It is available from Scarlett Rose. There is also a gallery of quilts on her site. Scarlett Rose has allowed me to make these designs available in Inklingo format in order to eliminate the need to trace the pattern for San Kamon, and to allow you to choose your own size. As Scarlett Rose says: For those of us who are using computers and the Internet, Inklingo is perfect. I really like having the wonderful choices it offers me in printing out the San Kamon knots. I've converted some quilters, helping them to discover the possibilities for applique and now for embroidery. I try to enlighten the students to new options. 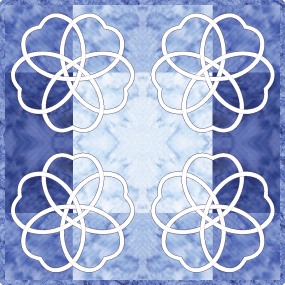 Click on the quilt to see a gallery of designs.